I’d be remiss in not at least once bringing up the pure luxury of a simple salt or sugar scrub. First of all, you don’t have to pay huge amounts of money for this kind of product, as it’s something you can easily make in your own home! That said, of courseit’s worth the $12 to buy my beautiful essential oil blended scrubs with premium dead sea salts, a diverisity of high quality therapeutic oils, and nice packaging. (I had to say that, I’m running a business) But seriously, $12 is a totally reasonable price. Many companies charge upwards of $25 or more for such a product. And again, you can do this yourself! Salt or sugar scrubs are absolutely marvelous. There are many versions out there, some which contain soap or ‘whipped’ soap, some that are emulsified with other oils and waxes (such as my brown sugar scrub) and many that are simple combinations of salt or sugar and oils. Cheap versions –such as some chain bath & body stores that I won’t name outright–use petroleum-based oils as the primary ingredient in these products. Not helpful. The point of a body scrub is to provide exfoliation to slough off the outer dead skin sells and thus ‘polish’ the skin into a healthy, revitalized glow. Not only does this get rid of the dull outer skin cells, but it also increases circulation and invigorates the tissue. The oils then sink into the fresh layer of skin to provide nourishment, moisture, and protection from the elements. Indeed, oils not only provide SPF protection against UV rays, but the oil also acts as a natural barrier to keep the skin from getting too dry or chapped. Scrubs are great in the summer because they keep your skin glowy and fresh, and somehow, even more necessary in the winter because they keep your skin protected and well-moisturized. I find that I don’t need a moisturizer when I use a polish towards the end of a shower or bath, and my skin doesn’t get that winter itchy, dry feeling that is the norm. For those who don’t like applying oils directly to the skin in this way or like something a bit smoother in texture, an emulsified scrubis ideal. This is a bit more high-tech to make and so it’s better purchased, but emulsified scrubs do eliminate the slippery oils that can often coat the floor of the bath tub in the former. Some people hate those oils and also find the salts a bit too harsh if they have extra sensitive skin. The oils are actually in a solid state, adhered to the fine sugar crystals, so the texture is like fine breadcrumbs. A handfull of this can really do the trick in gently exfoliating and moisturizing the skin. So how do you make something like this at home instead of spending a lot of cash on the so-called ‘upscale’ spa version? DIY – Simple Sugar or Salt Scrub. 1. Find a nice container – plastic or glass – and make sure it is clean and dry. It’s very important that you keep the container as dry as possible and try to avoid getting water in the scrub unless you intend to use it up quickly, as the introduction of water can create a potential for mold growth, especially if the scrub sits around with water in it. 2. Fill the container with salts or sugar – it doesn’t matter what kind, though an extra course texture of salt or sugar will be more ‘scratchy’. I find that the finer the texture, the better, in most cases. Leave a little of room on the top but not more than 1/2″ – 1″. 3. Add a little Vit E (squeeze out one capsule or add 1/2 tsp oil) to prevent rancidity (if you have it on hand). 4. Add the fragrance. Start with 20 – 30 drops of your favorite essential oil. I generally advise away from most fragrance oils because of the presence of pthalates and because only true essential oils offer aromatherapeutic benefit. That said, some essential oils are extremely expensive, so you might have to use a fragrance oil to get the scent you want. For true essential oils that are readily available and affordable: Try ylang ylang for intense, heady floral notes; orange for a lovely citrus fragrance: peppermint & rosemary for something zesty and refreshing (don’t overdo the e.o.s on this); lavender for its beautiful, relaxing qualities; or patchouli for it’s earthy, sensual scent. 5. Fill the container with a skin-nutritive, natural oil or blend of oils. Jojoba, Sesame, Olive, Grape seed, or other oils, many of which you may be able to find in small quantities at your grocery store. Do NOT use mineral oil, J&J “baby oil” (How can J&J actually market this for babies? ), or other petroleum-based oils, as these are equivalent to putting saran wrap on your skin. The petroleum oil creates a barrier but doesn’t provide any true moisturization or nutrition for your skin cells. It’s basically a useless oil slick, as far as I’m concerned. Voila! Pure luxury for the bath time ritual and an absolute must for regular skin exfoliation and moisturization. See my store for various salt scrubs, including my Ayurvedic Healing Scrub for those who suffer from skin conditions such as psoriasis. Wow, is this time of year ever insane! We had Thanksgiving at my house and of course the TLA/City Paper trunk show was on Friday, so the last week was pretty exhausting. The holidays are fun, though, and a lot of people seem to love all the hustle and bustle. Looking for ideas for handmade gifts? One great way to make a simple, yet appreciated handmade gift is to try out Melt & Pour soaps. Most wholesalers (such as essentialwholesale.com, http://www.pvsoap.com and fromnaturewithlove.com sell melt & pour bases. All you need to do is buy the base, melt it down in a double boiler. Then you add your additional goodies, such as calendula-blossom infused oil, shea butter, jojoba beads, or lavender blossoms, and a small amount of pure essential oil. And finally pour it into plastic tray molds (also available for purchase at those sites). 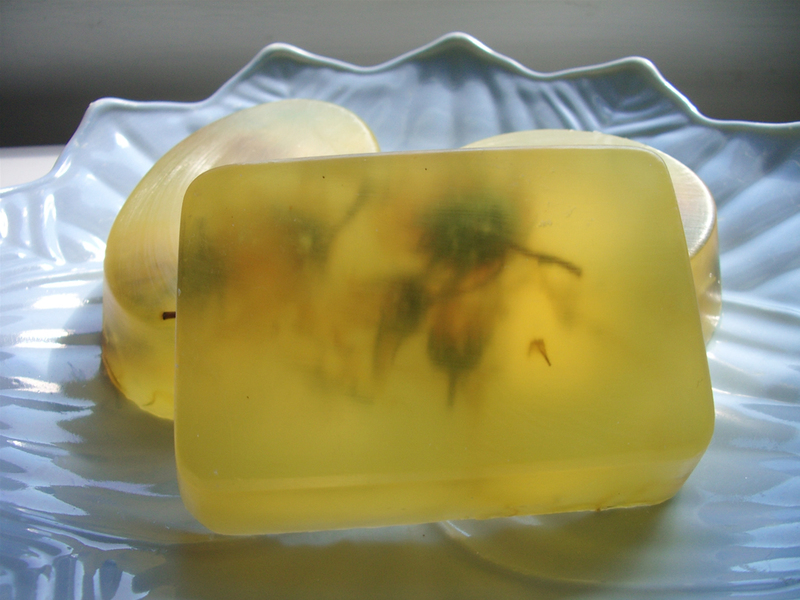 * Try making guest soaps with small guest soap sized mold trays and then wrap in cellophane with ribbon. * Get creative with packaging by using hand-stamped paper, cardboard wraps, raffia, ribbon, and handmade tags. * Add natural herbal colorants like a tiny amount of tumeric or beet powder to alter the color. * Use your favorite essential oil blends or a simple essential oil that is well-liked, such as lavender or patchouli. Try to avoid fragrance oils, as they often contain harmful pthalates.